Iranian student hit by Muslim ban, Tampa Bay students rally to bring him home | Fight Back! Due to the Trump administration’s recent Muslim ban, which bars entry of nationals from seven Muslim-majority countries, USF student Mehdi Zeyghami was denied re-entry into the country. Additionally, USF administration put a punitive freeze on all of Zeyghami’s accounts on university servers after his participation in an interview for an article published by the Tampa Bay Times. This freeze has isolated Zeyghami from his peers and has ensured that he cannot finish his education at USF. Though USF administration claims to care about their students and hopes to encourage an environment of diversity, Zeyghami’s case is not an oddity. USF administration has a long history of repressing students and teachers, especially if they’re Muslim or Arab. One such case was that of Sami Al-Arian, a renowned and outspoken Palestinian-American civil rights activist and professor at the university from 1986 to 2003. In a now nationally recognized case of violation of First Amendment rights and academic freedom, Al-Arian was fired from USF and was later deported from the U.S. for supposed ties to a ‘terrorist’ group. The Trump administration’s policies of hate, such as the Muslim ban, present further opportunities for USF and other universities to exercise racist policies that restrict who is allowed access to higher education and who might teach it. 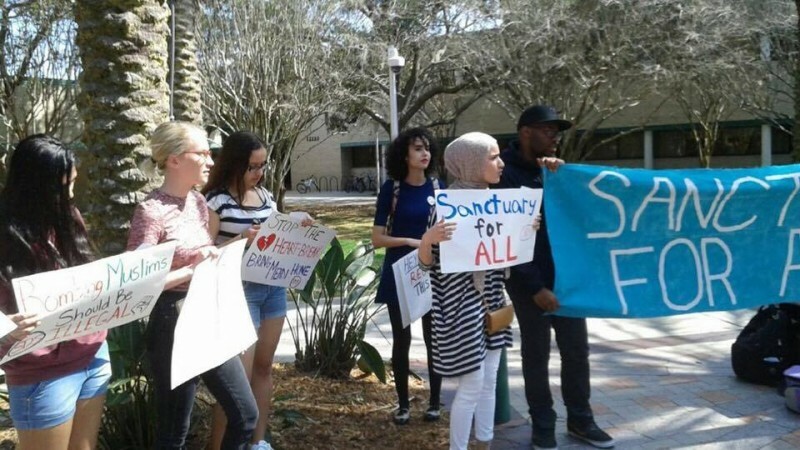 It was because of the Muslim ban, cases such as Sami Al-Arian’s, and USF administration’s recent handling of the Mehdi Zeyghami case that Tampa Bay Students for a Democratic Society (SDS) started their Sanctuary for All campaign, and organized the rally, alongside Students for Justice in Palestine (SJP), to bring Mehdi home. The rally began with a variety of chants including, “USF shame on you! Mehdi is a student too!” There were also several speeches featured, from members of SDS and SJP. “Our new long term campaign is working towards USF becoming a sanctuary campus. This entails USF taking an active stance against racist, xenophobic and Islamophobic policies to protect everyone involved with USF: Students, faculty, staff, etc. Mehdi is one of us and deserves to finish his education at USF, a university that claims to have its students’ best interests at heart,” said SDS member and emcee of the event, Ennya Blaize (pronouns: they/them).